Chapter appears in Mourning Animals edited collection – Christina M. Colvin, Ph.D. Receiving a book in the mail is delightful; receiving a book in the mail that contains a chapter of your own work is even better. I’m thrilled to be a part of the beautiful and important collection that arrived in my mailbox today: Mourning Animals: Rituals and Practices Surrounding Animal Death. The collection is edited by the great animal studies pioneer and advocate Margo DeMello and published by Michigan State University Press as part of its Animal Turn series. 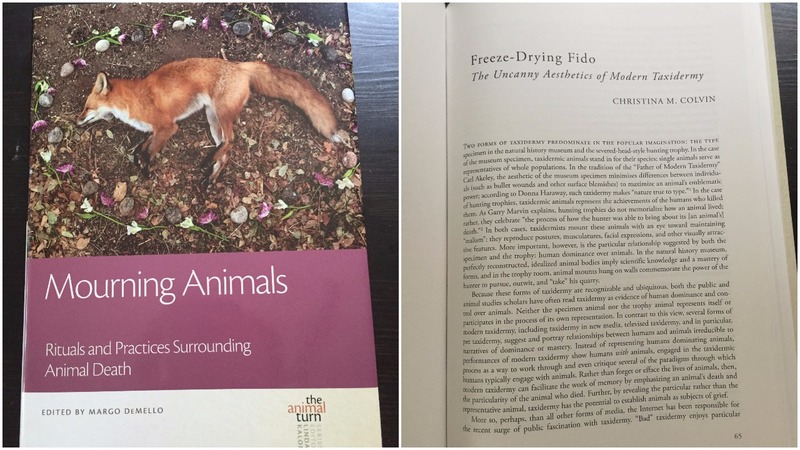 My chapter, “Freeze-Drying Fido: The Uncanny Aesthetics of Modern Taxidermy,” considers taxidermy in new media, the pet preservation industry, experimental (or “rogue”) taxidermy, and two reality television shows that feature taxidermy and taxidermists: American Stuffers and Immortalized. My analysis suggests that much modern taxidermy may unexpectedly facilitate the work of memory and grief by emphasizing an animal’s death and the particularity of the animal who died. Check out Mourning Animals and the other fine books in MSU Press’s Animal Turn series here.